5 x Black Insulated 55mm Crocodile Clip Connector 20A Alligator. Manufacturer Part Number: J00026A2001. 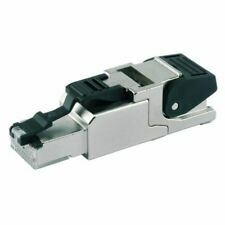 Type: RJ45. RoHS Compliance: RoHS Compliant. Plug / Socket: Plug. These connectors have closed 'turned' pins manufactured that will accept round pin headers and make an excellent interconnection solution. Lead Pitch: 2.54mm. 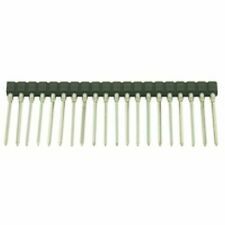 Number of Pins: 32. We want you to feel confident that you are purchasing the right product from the right Electronic Component supplier. S.T. L7805C2T Regulator. TO220 Style. Manufacturer: ST. Quantity - 4 pieces. distribution problems associated with single point. 5 Volt, 1 Amp. Each type employs internal current. Internal current limiting, thermal shut-down, safe area protection. Battery Covers.Terminal Stud Covers. Positive. Negative. Red. Black. Insulated. This item is NEW. You will receive 10 pieces. • 5 sets of Mini micro JST XH connector plugs and cables. • Wire is 24 AWG. Suitable for Tri-rated cable. DIN 46228-4. 2 x 6.0mm YELLOW 12mm barrel. Quantity of 5 sets. One set includes the plug, one wire of 150mm in length. Total of 10 pieces. Length: 0.5m. Supplied in pairs (red and black). Product Details : Product Weight : 30 grams. Consists of a threaded section with captive hex nut. M3 mounting thread; supplied with fixing nut. During that process you will be issued with an RMA number. Images shown are for demonstration purposes. A brand-new black plastic connector hood designed to fit the following connectors:23-way D connector male plug23-way D connector female plugThe 23-way D connector is primarily used on the Commodore Amiga computer and these parts are becoming very hard to find. A turned pin SIL header designed to be used in conjunction with SIL sockets. Can be snapped to the desired length for use. Lead Pitch: : 2.54mm. Number of Pins: : 32. This does not affect overseas orders. Used for connecting PP3 (9 Volt) Batteries. Line Following Robot Buggy car for the BBC micro:bit SELF BUILD KIT. Pin pitch: 2.5mm. This lot is for 10 pairs of JST-SM 2/3/4/5/6 Pin connectors (2 of each male female). Honesty, reliability & integrity - I am not a ‘dump & run’ trader. As a UK born citizen, I am able to communicate in an effective manner.